In the Summer I usually surf before 7 a.m. or after 5 p.m. because the parking lot is open to non-residents. These are also prime time hours to find the treasure hunters, typically older folks with metal detectors strapped to their arms, large headphones on their heads and clutching onto metal strainers as they comb the beach in search of loose change, jewelry and watches. I always ask what they’ve found that day and what’s the best thing they’ve ever found. I’ve heard stories of wedding bands, diamond earrings, Rolex watches and other treasure, but more often than not it’s spare change, bottle caps and trash. As a way to appease the treasure gods they almost all properly dispose of the trash. For jewelry and watches most claim to turn-in their booty to the police, where after so many weeks of it going unclaimed, it goes back to the treasure hunter guilt-free. I’ve always wanted to search the beach for lost treasure, but I’ve always felt that was an older persons hobby and by the way, a good form of exercise. For a youngster such as myself it seems somewhat desperate and overly nerdy, but I think I have found the solution in a pair of covert metal detecting sandals offered by Hammacher Schlemmer. 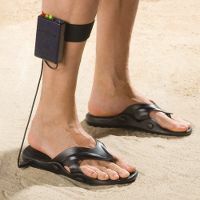 With a copper coil built into the right sandal and a battery pack/receiver that straps onto your leg, you have sufficiently disguised your true passion with something more along the lines of a parolee simply enjoying his or her newly found freedom by taking a stroll on the beach. Able to detect metal objects as deep as two feet, some might even mistake your fancy footwork as you hone-in on an object as a freedom dance (and they are none the wiser). The leg unit also flashes, vibrates and buzzes as you happen upon the presence of metal. Be sure to alert concerned onlookers that it’s OK, you’re within your legal boundary and that gigantic hole you’ve started digging isn’t a hideout. Powered by a single 9-volt battery, the Metal Detecting Sandals are $60, a paltry price to pay for your dignity and possibly a Rolex.